For only the second time, the head of an overseas branch of the Orthodox Church will be visiting Alaska. 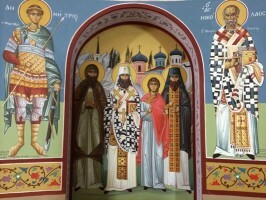 The Primate of the Orthodox Church of the Czech Lands and Slovak, Metropolitan Christopher, the Archbishop of Prague, will spend two weeks in Alaska, attending dedications of new Russian Orthodox Churches and attending the annual Pilgrimage of Saint Herman in Kodiak. Patriarch Aleksy II of Moscow visited in 1993 on the bicentennial of Orthodoxy’s arrival in America. 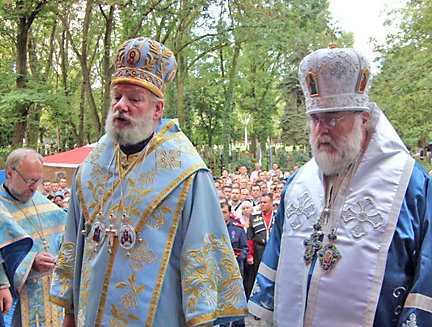 Metropolitan Christopher, left, with Bishop (now Archbishop) Benjamin in the Czech Republic in 2011. 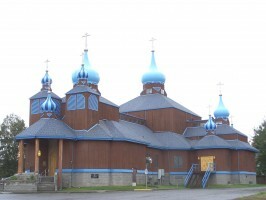 Father Michael says the metropolitan will have a busy schedule as soon as he gets to Alaska, including attendance at the groundbreaking of a new Orthodox church in Wasilla, but he will get two days to fish and bear-watch on Lake Clark. 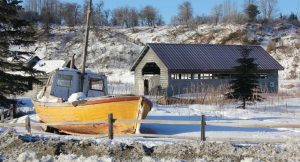 After blessing the newly-renovated church in Nondalton, the metropolitan and his entourage will head for the Kuskokwim River, where several stops are planned. Metropolitan Christopher is scheduled to arrive in Alaska on Saturday, and he will be in Kodiak for the pilgrimage from August 7th through the 9th. Unfortunately Father Michael will be teaching a college course and will be unable to attend the pilgrimage this year.